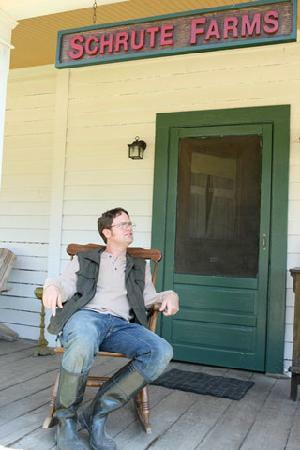 Over the past couple of months, we have talked about a spinoff series that involves Dwight Schrute from NBC’s ‘The Office’ and his family on the Schrute farm. According to TVLine, Rainn Wilson will star and we should get a special peak of the new series, now called ‘The Farm’ as the crew of ‘The Office’ will shoot a teaser for the new series as they shoot their upcoming ninth season of ‘The Office’. 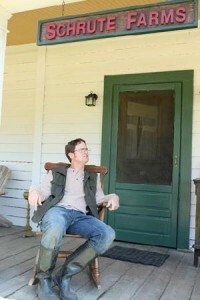 In the new show, Dwight and his kin inherit a large family farm/bed-and-breakfast. When Dwight decides to give the new venture a go, he must talk his brother and sister into joining him. What can you say? Bears. Beets. Battlestar Galactica. FANNIE SCHRUTE – Attractive, urban and in her late 20s/early 30s, Dwight’s younger sister fled the Schrute farm life for Boston as soon as she could, and has had little to do with her roots for quite some time. Now divorced with one son, Fannie is “a bit of a pseudo-intellectual lefty” with an ironic sense of humor and a great heart. CAMERON WHITMAN – Dwight’s smart and slightly weird 9-year-old nephew (Fannie’s son) is a cosmopolitan lad who nevertheless feels the pull of his Schrute heritage, especially when he’s around someone — his uncles, perhaps? — who can offer the fatherly guidance he lacks. HEINRICH MANHEIM – The Schrute siblings’ great uncle is charming, greedy, manipulative… and just may have had to spend time in Argentina following World War II, thanks to his German National Socialist roots. Oh, and he vows to kill Dwight by the end of the first episode. I’ll definitely give this a shot. How about you folks? This entry was posted on Monday, July 2nd, 2012 at 5:54 pm	and is filed under News, Television. You can follow any responses to this entry through the RSS 2.0 feed. You can skip to the end and leave a response. Pinging is currently not allowed. « HBO Renews ‘The Newsroom’ and ‘True Blood’!! !